Happy Wednesday! How are you all today? I'm personally happy it's the middle of the week because that means the weekend is right around the corner! Sleep in Saturday has become my favorite day. So close, but yet so far. Today I'm back posting with The Beauty Buffs! Our theme this week is Nautical/Beach theme! Since I just did a nautical manicure a few weeks ago for Twinsie Tuesday, I decided to embrace the beach part of our theme! 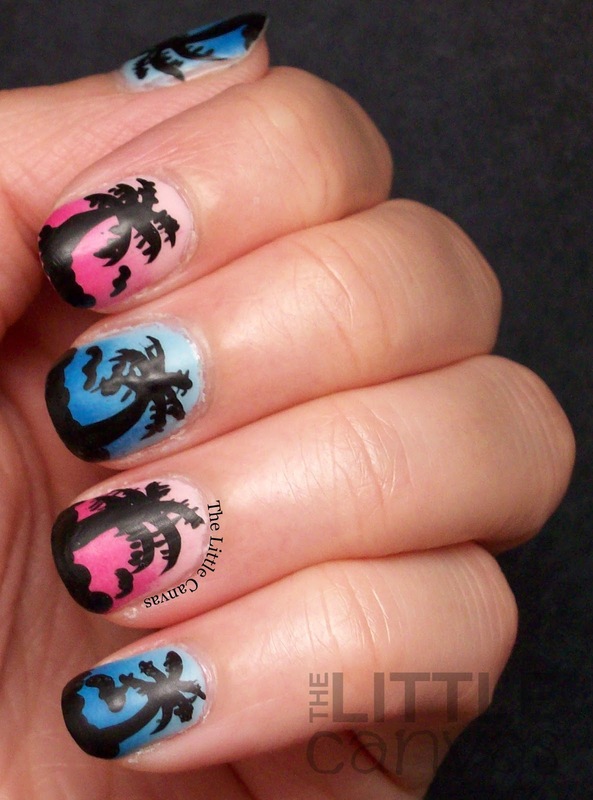 Especially after I saw this palm tree manicure by One Nail To Rule Them All. 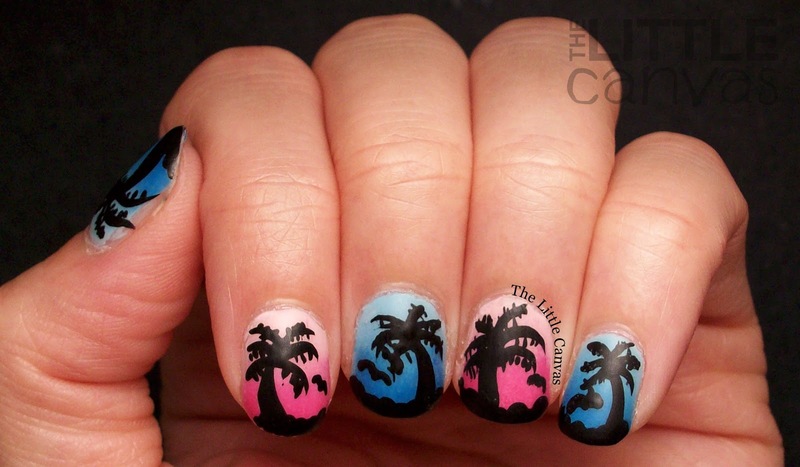 I have done sunset palm tree manicures in the past, but never was too fond of them. My gradients typically were weird and unevenly spaced so when I covered the tip with the black beach, the gradient itself disappeared and it looked like I had a one color base. 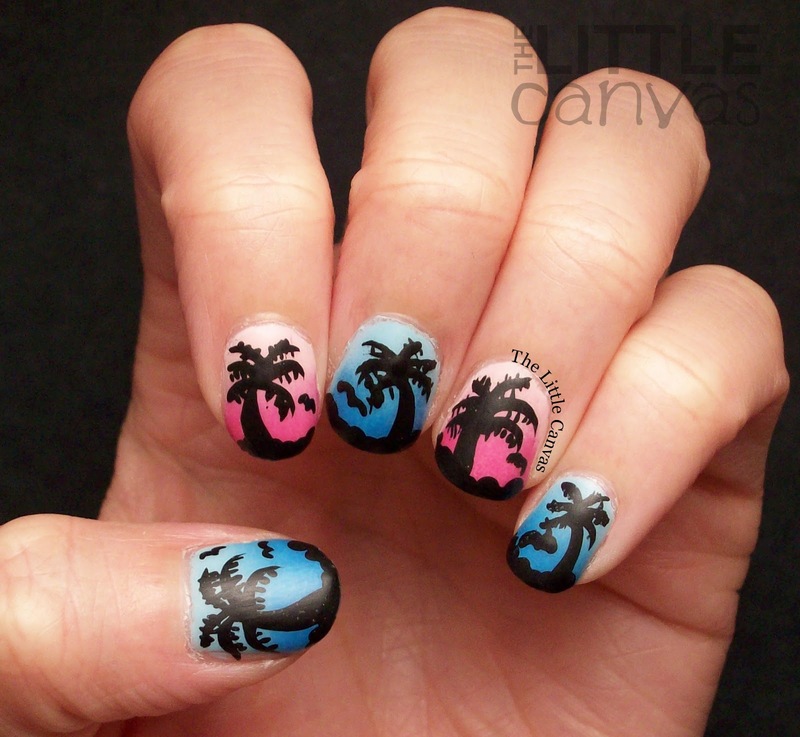 Not to mention, my palm trees were always sloppy and awful. After seeing Alice's manicure and tutorial, I thought I would give it a try! Let's take a look! Pretty neat right? I started off with a base coat of the lightest polishes. For the blue nail I used two coats of Bright Lucite (which I need to get ten more bottles of) and FingerPaints Petal Obsession from the new Film Noir collection which will be hitting stores soon! While they were drying, I put painters tape around all my nails and got my sponges ready to do a gradient. Some people put Elmer's glue or peel off base coat around their nail before doing a gradient, and I do tape. It is a little tedious but a lot quicker to remove than the peel off base. Plus, I find if I don't use the tape, I get my paint all in my cuticle and then when cleaning up I ruin my actual design. After I was all taped up and ready to gradient,I painted a line of the lighter and darker polish onto the sponge then dabbed it onto the nail. After a few dabs, the color was just how I wanted it. You can obtain the desired look so much faster when you use the lightest color as the base. I recently found this out and each time I create a look using this technique, I'm mind blown that I haven't been doing it all along. After my gradient was dried, I used my dotting tool and created the rocky shore. 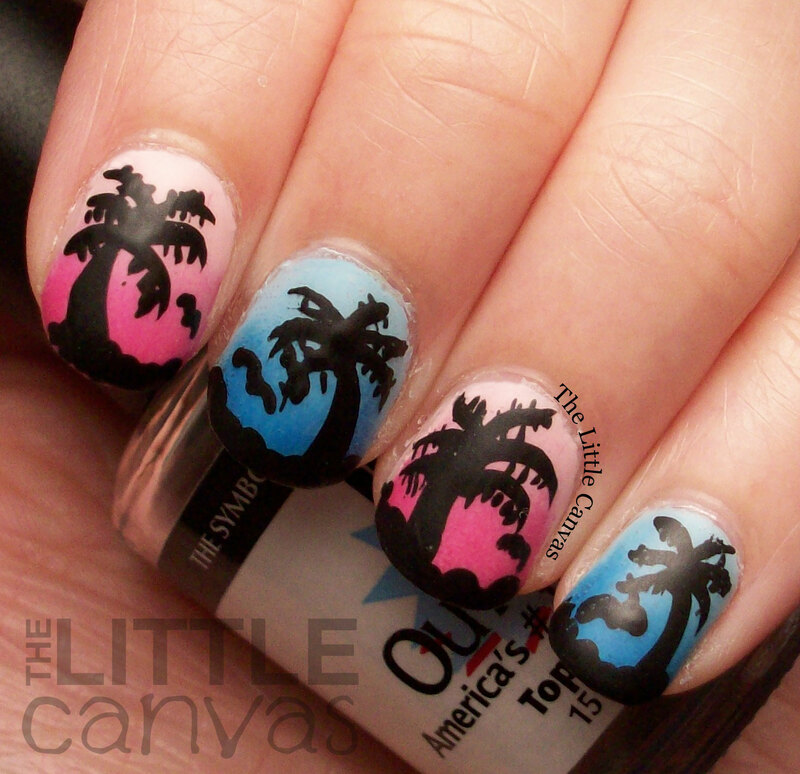 With my striper I then went through and added the palm trees and all their little details. The seagulls were added using a nail art brush because I'm not that good with a striper. Honestly, I'm not that good with a nail art brush either because they look like messed up bats. Before adding my OPI Matte top coat, I followed some of the lovely Beauty Buffs advice from way back when we were first starting, and that was to apply a glossy top coat on my nail first. Last week I did another matte design that has yet to go on the blog and I forgot to do this step, and it practically ruined my art work. The matte smeared my design something awful and I had to fix a few nails, and a few days later my nails were cracking. With this manicure after applying the glossy then doing the matte, I had no smearing or cracking. Instead I had a nice even matte look. What do you think? Liking the beachy theme? Think I should have gone nautical? Don't forget to check out the other lovely ladies posts!